We characterized 2005 individuals from nine populations in the region of Tlemcen in Western Algeria for the ABO, rhesus, MNSs, and Duffy blood groups, in association with genetic traits. The results were compared to those for other populations in Algeria, North Africa, and Southern Europe, in order to situate and clarify the genetic status of this region. Principal-component analyses and phylogenetic trees of the matrices of the genetic distances, on the regional and Mediterranean scales, reveal strong homogeneity at the regional level and convergence between North African populations. This indicates high genetic affinities among these populations. This study highlights the differences between the two sides of the Mediterranean, probably due to the independent peopling history of these populations after they had settled. The resulting genetic structure of these populations is best explained by a combination of gene flow, ecology, and history. The genetic diversity of human populations reflects the routes followed by our ancestors during their migrations throughout the world. In the Mediterranean region, and in North Africa in particular, the data suggest a complex pattern of human movements. Archaeological data and historical accounts provide evidence of relationships between the different Mediterranean peoples since ancient times. However, the dates and the geographical locations of their expansion are debatable (Stringer, 2000). In this regard, North African populations probably played an important role in the early migrations of modern populations. It has been demonstrated that there were links between sub-Saharan populations and those of Western Europe until the recent past. Contacts between different civilizations, migrations, and the spread of successive cultures, which reveal the tracks of history, may also have determined the genetic relationships between the different populations. Many of the investigations started in Tunisia, Algeria, and Morocco in the late 1930s and early 1940s could not be completed because of the disruption associated with World War II. However, Benabadji and Chamla (1971) resumed the genetic studies of this region by examining the ABO and D/d rhesus alleles in a large sample of Algerian blood donors. The results indicated the predominance of genetic homogeneity due to gene flow between different regions of Algeria, but with some migration emanating from sub-Saharan Africa and Mediterranean Europe. Since 1964, multidisciplinary studies have been conducted on sedentary and nomadic populations of the Algerian Sahara, mostly on Tuareg tribes in the central region. Over a period of 30 years, more than 10000 samples have been examined for an ever-increasing number of red cell and serum genetic polymorphisms (Benabadji et al., 1969; Ruffle and Lefevre-Witier, 1972; Lefevre-Witier, 1974, 1996; Constans et al., 1980; Aireche et al., 1982; Aireche and Benabadji, 1986). A number of recent studies have also surveyed North African populations on the basis of non-recombining Y, single-nucleotide polymorphisms, and mitochondrial DNA (mtDNA). The mtDNA analysis of a sample of west Algerian students from the wilaya of Oran concluded that Algerians are genetically close to an Israeli-Arab population and have less affinity to the Mediterranean populations of Sicily, Majorca, Calabria, and Sardinia (Ivanova et al., 1999). Similarly, Bosch et al. (2000) sampled Moroccans from northwestern Africa, including northern, central, and southern Berbers, Saharawis, and Mozabites. They tested DNA samples with two panels of autosomal STRs, and compared them to reference populations. The North African groups clustered with an Arab sample (Lefevre et al., 2006). One of the largest population movements on both sides of the Mediterranean was the conquest of the Iberian Peninsula by North Africans. The Arabs came from the East to West, bringing their religion and language. One of the most important passages of Arabs to the Iberian Peninsula occurred from the region of north-west Algeria (Lethielleux, 1974), suggesting the existence of an important migratory flow, genetic admixture, and cultural diversity within the region. In view of the rarity of anthropogenetic data on several Algerian populations, especially those of the western regions, we analyzed the genetic polymorphism of the ABO, rhesus, Duffy, and MNSs blood groups of nine Arab-Berber populations (Oulhaça, Honaine, Ghazaouet, M’sirda, Beniouerssous, Nadrouma, Benisnouss, Sabra, and Sidi El Djilali) in the region of Tlemcen in north-western Algeria, whose anthropogenetic characterization has never previously been reported. We compared our findings with previous studies of several populations of the Mediterranean basin. We identified a high degree of genetic homogeneity among these populations due to the long history of autochthonous populations spreading into this region. The analysis also reveals the genetic relationship between populations from the opposite sides of the Mediterranean Sea. The region of Tlemcen has very ancient human origins. It carries vivid traces of various ages, which today make it of archaeological importance. Bordering on Morocco, and occupying the western zone of the region of Oran (western Algeria), it extends over an area of more than 907000 ha of the littoral region in the north with the steppe in the south constituting a diversified landscape where four distinct physical landscapes occur (Figure 1). Its ancient past is attested by the existence of numerous monuments from the pre-Roman, Roman, and Arab eras. The Arabo-Muslim civilization has without any doubt marked this region for a long time, which was a crossroads during the reign of the powerful Idrisid, Almoravid, and Almohad Arab dynasties that governed the Maghreb in the Middle Ages (Lethielleux, 1974; Hassar, 2000). Map showing the region of Tlemcen and the surrounding areas. The nine populations selected (Oulhaça, Honaine, Ghazaouet, M’sirda, Beniouerssous, Nadrouma, Benisnouss, Sabra, and Sidi El Djilali) have the peculiarity of having been considerably enriched genetically and culturally by the various invasions they have undergone (Phoenicians, Carthaginians, Romans, Arabs, etc.) and by their geographic location in the Tlemcen region, which was one of the main departure points for Arabs from the East crossing over to the Iberian peninsula (Carette, 1853). At the same time, these populations have remained highly conserved and isolated because of their geographical location (mountains, cliffs, steppes, etc. ), and by their tribal structures. Virtually all the first families that founded these populations came from the Maghreb. Over time, these families settled and formed tribes and douars (Desanges, 1980; Churchill, 1981). This study was conducted from July 2008 to December 2009. The individuals analyzed came from nine populations located in the region of Tlemcen according to the geographical gradient: littoral (Oulhaça, Honaïne, Ghazaouet, M’sirda), hills (Nadrouma, Beniouerssous, Benisnous, Sabra), and high plateau (Sidi El Djilali). Informed consent was sought and obtained from all donors (Executive Decree No 276 of 6 July 1992 concerning Medical Code of Ethics). The blood groups were determined from samples taken from 2005 unrelated individuals belonging to the nine populations. Approximately 10 ml of blood were collected per individual. The blood grouping was performed within a few hours of taking the samples. We cleared the plasma surrounding the red blood cells by washing the blood before determining the phenotypes. 0.5 ml samples were placed in hemolysis tubes filled with saline (0.9%). After suspension by gentle stirring, they were centrifuged at 1000 rpm for 1 minute, and the supernatant was removed. This procedure was repeated twice. The third pellet of red blood cells was resuspended (5%) to be used for blood grouping. We observed the presence or absence of antigens on the surface of red blood cells by using specific antibodies to determine the blood group. Each antigen was determined twice, using two different batches (or two clones for monoclonal reagents). The reagents were used according to the manufacturer’s instructions. Allele and haplotype frequencies were estimated according to the maximum-likelihood method using Bernstein’s method to estimate ABO allele prevalences, then checked for Hardy–Weinberg equilibrium by comparing the absolute observed frequencies with the theoretical frequencies. The Bernstein estimates of p, q, and r are given by: p = 1 − (F[B] + F[O])1/2, q = 1 − (F[A] + F[O])1/2, r = (F[O])1/2, where F[ ] indicates the phenotypic frequency (Nan Juan and Gart, 1976). The validity of the results was verified by determining the chi-square of the observed values. Results with P < 0.05 were considered statistically significant. The biological relationships between the populations analyzed (Table 1) were represented by a two-dimensional diagram obtained by a principal-component analysis using ADE-4 software (Chessel et al., 2004). The genetic distances between the populations were estimated from the genetic frequencies data as the Reynolds coefficient of coancestry (Reynolds et al., 1983), using the Phylip 3.5C program. The degrees of similarity between the populations were estimated from the genetic distance matrices using the neighbor-joining method (Saitou and Nei, 1987) with the Phylip 3.5C program. a Cited by Afkir (2004). The relative rate of genetic flow between populations was estimated by tracing the average distance from the center of the allele frequencies for each region against the degree of heterozygosity for each locus (Harpending and Ward, 1982). A simple linear regression was then traced between the heterozygosity level of a population and its distance, defined as the arithmetic average of the gene frequencies. The bibliographic database used for the comparative study (frequency distributions and allele haplotype) appears in the various publications cited in Table 1 and in the bibliography. The frequencies of the ABO, rhesus, MNSs, and Duffy blood groups in the nine populations are summarized in Table 2. The chi-square test values show that these frequencies did not deviate from the Hardy–Weinberg equilibrium for the four groups in any of the populations. 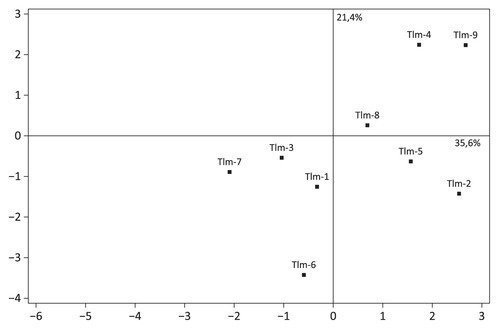 Figure 2 and Figure 3 represent the projections on the first two axes (which contribute 57% of the total variability) of the principal-component analysis of the nine populations and the blood groups, respectively. The first axis (35.6% of variance) separates the haplotype frequencies (cDe, CdE, cde, NS, and NS) and the alleles (ABO*O and Fy b + o), which appears to distinguish the populations of Honaïne, Nadrouma, M’sirda, Benisnouss, and Sid-Djilali from those of Oulhaça, Gahzaouet, Beniouerssous, and Sabra. 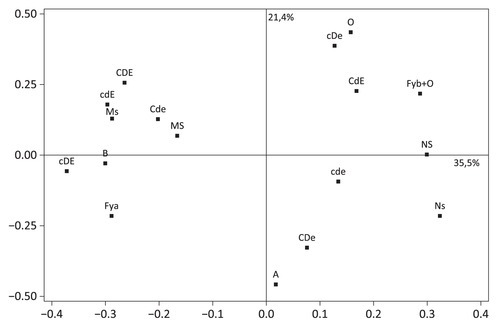 The second axis (21.4% of variance) separates the populations of M’sirda, Benisnous, and Sid El Djilali, which correlate with the haplotypes cDe and CdE and the ABO*O and Fy b + o alleles, from the remaining populations. Principal-component analysis based on allele frequencies of the nine populations studied (for abbreviations, see Table 2). Contribution of the allele and haplotype frequencies of the blood systems in Figure 2 (for abbreviations, see Table 2). The phylogenetic tree (Figure 4) based on hierarchical classifications of neighbor-joining (Saitou and Nei, 1987) was constructed from a matrix consisting of Reynolds distances (Reynolds et al., 1983). This tree confirms the results obtained from the principal-component analysis. It distinguishes three population clusters. 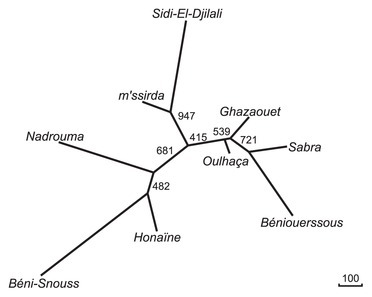 The first cluster includes the populations of Oulhaça, Ghazaouet, Sabra, and Beniouerssous; the second cluster includes those of Sid-El-Djilali and M’sirda, and the third cluster includes Nadrouma Honaïne and Bnisnous. However, we can observe in this plot that the three clusters are closer, probably due to the insignificant difference between the genetic distances. Therefore, neither of these two analyses (the principal-component analysis and the phylogenetic tree) shows any significant difference between the nine populations studied on the geographical level, which suggests a high degree of homogeneity between these populations. This could be explained by the long history of autochthonous populations spreading into this region, and their particular coastal environment and political history, especially during the Ottoman period. Neighbor-joining tree of the genetic distances estimated from the blood group allele frequencies of the nine populations. Statistical support at the internodes on the trees was assessed by 1000 bootstrap replications employing the Consense programme included in the Phylip package (for abbreviations, see Table 2). The regression analysis of the heterozygosity level of populations over the distance of the distribution center of the allele and haplotype frequencies (Figure 5) shows that most of the nine populations are situated near the theoretical regression line, with the exception of the population of Sid-El-Djilali. The low heterozygosity level of this population could be due to its geographical isolation and the frequent practice of endogamy. 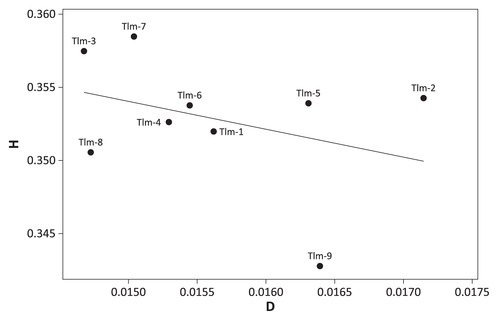 Regression chart among the heterozygosity level averages by locus (H) and the central distance of the distribution of the nine studied populations (D) (for abbreviations, see Table 2). We compared the distribution of gene frequencies of the blood groups in our nine populations with those in some other North African and northern Mediterranean populations. Figure 6 shows the distribution of the blood groups after principal-component analysis. The first two axes account for 54.6% of the total variability. The first axis (28.1% of the variability) separates the majority of the North African populations, including our nine populations, from the populations of the northern Mediterranean coast, according to the allele frequencies of the group NS and Fy b + o. The second axis (21.4% of variability) separates the populations of Nadroma, Middle Atlas, and southern Arabs from all the other populations, suggesting the existence of genetic similarity between these three populations. Principal-component analysis based on allele frequencies of the nine populations studied and other North Africa and Northern Mediterranean populations (for abbreviations, see Table 2). The phylogenetic tree (Figure 7) obtained from the matrix of the genetic distances of the Mediterranean basin populations also distinguishes two major clusters, reflecting the genetic affinity between the populations. The first cluster includes all the northern Mediterranean populations, while the second, which includes all the North African populations with the exclusion of that of Libya, is divided into two branches. The first branch includes the populations of Nadroma, Middle Atlas, the southernmost Arabs, Beniouerssous, and Sabra, and the second branch includes all the remaining populations. Neighbor-joining tree of the matrix of the genetic distances estimated from the blood group frequencies in the nine populations. Statistical support at the internodes on the trees was assessed by 1000 bootstrap replications employing the Consense programme included in the Phylip package (for abbreviations, see Table 2). 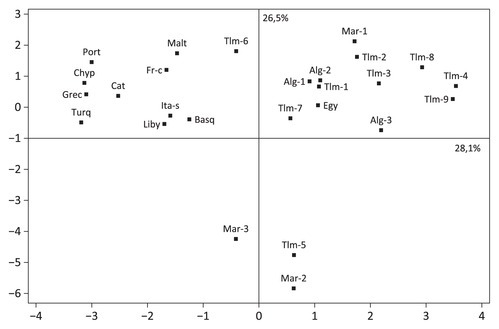 Our anthropogenetic analysis of nine Arab-Berber populations from the region of Tlemcen, shows that these populations display a high degree of genetic similarity, but differ from a larger group of populations in other Mediterranean countries. The analyses reveal genetic difference of these populations from the opposite sides of the Mediterranean Sea, suggesting the importance of geographical barriers, as well as cultural divergences, which constitute an obstacle to the mixing of populations (Simoni et al., 1999). The great affinity that exists between the Arab and Berber Algerian populations and the other North African populations is consistent with the findings obtained using other genetic markers (Blood groups: Flores et al., 2000a; Sanchez-Mazas, 2000; Harich et al., 2002; Gm: Loueslati et al., 2001; Dugoujon et al., 2004; HLA: Bosch et al., 1997; Gómez-Casado et al., 2000; Arnaiz-Villena et al., 2002; Choukri et al., 2002; Ouhmani et al., 2002; Y chromosome: Bosch et al., 2001; Khodjet El Khil et al., 2001; Alu sequences: Flores et al., 2000b). It is, therefore, legitimate to suppose that great genetic, geographical, linguistic, and cultural similarities have developed between these populations. It is possible that this genetic similarity between Arabs and Berbers was already present before the Arab conquest. However, it is also conceivable that it results, in part, from the homogenization by reciprocal gene flow between those populations (Aireche and Benabaji, 1988; Coudray et al., 2006). These affinities could also be of more recent origin, and could be explained partly by large migratory flows in addition to the uninterrupted demographic movements of tribes and families from all corners of North Africa (Camps, 1981). In addition, though we do not have any precise information about the geographical and temporal origins of the populations analyzed, their genetic proximity to the populations of North Africa leads to the assumption of a common origin, which could date from the Upper Paleolithic, with the expansion of modern human from the Middle East extending towards the Mediterranean (Ammerman and Cavalli-Sforza, 1984; Ferembach, 1985; Straus, 1989; Harich et al., 2002). The genetic, archaeological, and linguistic data are all consistent with relationships between North Africa, the Middle East, and Europe. By comparing HLA polymorphism in the Spanish and North African populations with that in other Mediterranean populations, Arnaiz-Villenaen et al. (1999) postulates the existence of pre-Neolithic relations between North Africa and Spain. However, the historical depth of these relations remains controversial (Barbujani et al., 1994; Fernandez-Santander et al., 1999; Ennafaa et al., 2009). More genetic data will be required to date the relationships between the northern and southern shores of the Mediterranean before we can make a more precise dating of these relationships to about 10000 years before the present, the current limit of linguistic reconstruction. Our study is complementary to those of Mourant et al. (1976), Cavalli-Sforza et al. (1994), and Bosch et al. (1997), but we also need a more precise characterization by other markers for a better illustration of the ethnohistorical events specific to this vast Mediterranean region. Afkir A. (2004) Caractérisation anthropogénétique de la population Berbère d’AL Hoceima: Analyse comparative du polymorphisme des dermatoglyphes et des groupes sanguins ABO, Rhésus, MNSs et Duffy. Mémoire DESA, Université Chouaib Doukkali, Eljadida., Maroc. Aireche D., Gueguen A., Golmard J.M., and Benabadji M. (1982) Détermination des fréquences géniques dans le système rhésus en Algérie. Française de Transfusion et Immuno-hématologie, 25: 383. Aireche H., and Benabadji M. (1986) Le système Duffy en Algérie. Revue Française de Transfusion et Immuno-hématologie, 29: 121. Aireche H., and Benabadji M. (1988) Rh and Duffy gene frequencies in Algeria. Gene Geography, 2: 1–8. Ammerman A.J., and Cavalli-Sforza L.L. (1984) The Neolithic transition and the Genetics of populations in Europe. Princeton University Press, Princeton, NJ. Arnaiz-Villena A., Martinez-Laso J., and Alonso Garcia J. (1999) Iberia: population genetics, Anthroplogy, and linguistics. Human Biology, 71: 725–743. Arnaiz-Villena A., Gomez-Casado E., and Martinez-Laso J. (2002) Population genetic relationships between Mediterranean populations determined by HLA allele distribution and his perspective. Tissue Antigens, 60: 111–121. Atasoy S., and Abaci-Kalfoglu E. (1995) Polymorphism of conventional genetic markers and HLA system in Turkey. Anthropologischer Anzeiger, 55: 55–61. Barbujani G., Pilastra A., De Dominco S., and Renfrew C. (1994) Genetic variation in North Africa and Eurasia: Neolithic demic diffusion vs. Paleolothic colonization. American Journal of Physical Anthropology, 95: 137–154. Benabadji M., and Chamla M.C. (1971) Les groupes sanguins ABO et rhesus des Algériens. Anthropologie, 75: 427–442. Benabadji M., Ruffie J., and Lefevre-Witier P. (1969) Les grandes données de l’hémotypologie Sahariennes. In: Benabadji M., Boujnah A. (eds. ), Biologie des populations Sahariennes. Actes du Colloque International. Alger: Institut National de la Santé Publique, pp. 51–74. Bonné B., Ashbel S., Modal M., Godber M.J., Mourant A.E., Tillis D., and Woodhead G. (1970) Habbanite isolate, genetic markers in the blood. Human Heredity, 20: 609–622. Bosch E., Calafell F., Perez-Lezaun A., Comas D., Mateu E., and Bertranpetit J. (1997) Population history of North Africa: evidence from classical genetic markers. Human Biology, 69: 295–311. Bosch E., Calafell F., Perez-Lezaun A., Comas D., Izaabel H., Akhayat O., Sefiani A., Hariti G.G., Dugoujon J.M., and Bertranpetit J. (2000) Y chromosome STR hapolotypes in four populations from northwest Africa. International Journal of Legal Medicine, 114: 36–40. Bosch E., Calafell F., Comas D., Oefner P., Underhill P.A., and Bertranpetit J. (2001) High-resolution analysis of human Y-chromosome variation shows a sharp discontinuity and limited gene flow between northwestern Africa and the Iberian Peninsula. American Journal of Human Genetics, 68: 1019–1029. Camps G. (1981) Islam: société et communauté. Anthropologies du Mahgreb, sous la direction de Ernest Gellner, les Cahiers CRESM, Éditions CNRS, Paris. Carette E. (1853) Origine et migrations des principales tribus de l’Algérie. Exploration Scientifique de l’Algérie pendant les années 1840, 1841, 1842. Paris imprimerie impériale M DCCC LIII. Cavalli-Sforza L.L., Menozzi P., and Piazza A. (1994) The History and Geography of Human Genes. Princeton University Press, Princeton, NJ. Chessel D., Dufour A.B., and Thioulouse J. (2004) The ade4 package-I—one-table methods. R News, 4: 5–10. Choukri F., Chakib A., Himmich H., Raissi H., and Caillat-Zucman S. (2002) HLA class I polymorphism in a Moroccan population from Casablanca. European Journal of Immunogenetics, 29: 205–211. Churchill C.H. (1981) La vie d’Abd-El-Kader. SNED, Alger, pp. 134–136. Constans J., Lefevre-Witier P., Richard P., and Jaejer G. (1980) Gc (vitamin D binding protein) subtype polymorphism and variant distribution among Sahara, Middle East, and black African populations. American Journal of Physical Anthropology, 522: 435–441. Coudray C., Guitard E., Gibert M., Sevin A., Larrouy G., and Dugoujon J.M. (2006) Diversité génétique (allotypie GM et STRs) des populations Berbères et peuplement du nord de l’Afrique. Antropo, 11: 75–84. Desanges J. (1980) Les protoberbères. In: Ki-Zerbo J. (ed. ), Histoire Générale de L’Afrique. UNESCO, Paris, tome II, pp. 453–473. Dugoujon J.M., Hazout S., Loirat F., Mourrieras B., Crouau-Roy B., and Sanchez-Mazas A. (2004) Gm haplotype diversity of 82 populations over the world suggests a centrifugal model of human migrations. American Journal of Physical Anthropology, 125: 175–192. Ennafaa H., Cabrera V.M., Abu-Amero K.K., Gonzalez A.M., Amor M.B., Bouhaha R., Dzimiri N., Elgaaied A.B., and Larruga J.M. (2009) Mitochondrial DNA haplogroup H structure in North Africa. BMC Genetic, 10: 8. Ferembach D. (1985) On the origin of the Iberomaurusians (Upper Palaeolithic: North Africa). A new hypothesis. Journal of Human Evolution, 14: 393–397. Fernandez-Santander A., Kandil M., Luna F., Esteban E., Giménez F., Zaoui D., and Moral P. (1999) Genetic relationships between southeastern Spain and Morocco: new data on ABO, RH, MNSs, and DUFFY polymorphisms. American Journal of Human Biology, 11: 745–752. Flores C., Hernandez M., Gonzalez A.M., and Cabrera V.M. (2000a) Genetic affinities among human populations inhabiting the sub-Saharan area, northwest Africa and the Iberian peninsula. In: Arnaiz-Villena A. (ed. ), Prehistoric Iberia, Genetics, Anthropology and Linguistics. Kluwer Academic/Plenum Publishers, New York, pp. 33–49. Flores C., Maca-Meyer N., González A.M., and Cabrera V.M. (2000b) Northwest African distribution of the CD4/Alu microsatellite haplotypes. Annals of Human Genetics, 64: 321–327. Gómez-Casado E., Moral P., Martínez-Laso J., Garcia Gomez A., Allende L., Silverado-Redondo C., Longas J., Gonzales-Hevilla M., Kandil M., Zamora J., and Arnaiz-Villena A. 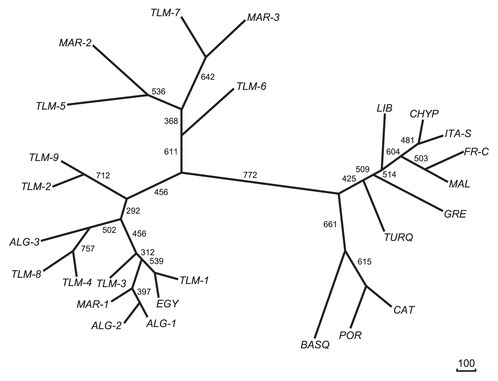 (2000) HLA genes in Arabic-speaking Moroccans: close relatedness to Berbers and Iberians. Tissue Antigens, 55: 239–249. 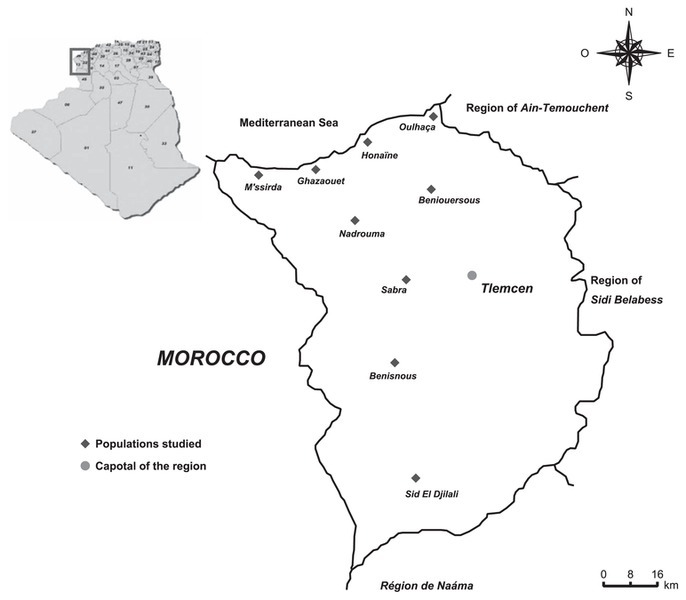 Harich N., Esteban E., Chafik A., Lopez-Alomar A., Vona G., and Moral P. (2002) Classical polymorphisms in Berbers from Moyen Atlas (Morocco): genetics, geography and historical evidence in the Mediterranean peoples. Annals of Human Biology, 29: 473–487. Harpending H, and Ward R.H. (1982) Chemical systematics and human populations. In: Nitecki M.H. (ed. ), Biological Aspects of Evolutionary Biology. University of Chicago Press, Chicago, pp. 177–199. Hassar B. (2000) Aperçu historique: Tlemcen, ancienne capitale du Maghreb central. Le lien, bulletin de l’association les amis de Tlemcen, no. 1, Paris, 5–6. Ikin E.W. (1963) The incidence of the blood antigens in different populations. Thesis, London. Ivanova R., Astrinidis A., Djoulah S., Lepage V., Wijnen E., Hors J., and Charron D. (1999) Mitochondrial DNA polymorphisms of a west Algerian population (Oran region). Biomedicine and Pharmacotherapy, 53: 386–392. Kandil M. (1999) Etude anthropogénétique de la population Arabe du Maroc Méridiaunal (Abda, Chaouia, Doukkala et Tadla). Thèse d’Etat. University Chouaib Doukkali, Eljadida, Maroc. Khodjet El Khil H., Triki Marrakchi R., Yacoubi Loueslati B., Langaney A., Fellous M., and Benammar Elgaaied A. (2001) Y chromosome microsatellite variation in three populations of Jerba Island (Tunisia). Annals of Human Genetics, 65: 263–270. Lefevre-Witier P. (1974) Un isolat du sud-Sahara: les Touaregs Kel Kummer: structures génétiques des systèmes sanguins érythrocytaires et sériques. Population. INED Institute of Demographic Studies, Paris, 3: 518–527. Lefevre-Witier P. (1996) Idèles du Hoggar, biologie et écologie d’une communauté Saharienne. CNRS-Editions, Anthropologie, Paris, p. 272. Lefevre Witier P., Aireche H., Benabadji M., Pierre D., Melvin K., Sevin A., and Crawforc M.H. (2006) Genetic structure of Algerian population. American journal of Human Biology, 18: 492–501. Lethielleux P.J. (1974) Le littoral de l’oranie Occidentale. Pro Manusripto. Centre de documentation économique et Sociale, Oran. Loueslati B.Y., Sanchez-Mazas A., Ennafaa H., Marrakchi R., Dugoujon J.M., Lefranc M.P., and Elgaaied A.B. (2001) A study of Gm allotypes and immunoglobulin heavy gamma IGHG genes in Berbers, Arabs and sub-Saharan Africans from Jerba Island, Tunisia. European Journal of Immunogenetics, 28: 531–538. Manzano C., Aguirre A.I., Iriondo M., Martin M., Osaba L., and De La Rua C. (1996) Genetic polymorphisms of Basques from Gipuzkoa: genetic heterogeneity of the Basque population. Annals of Human Biology, 23: 285–296. Memmi M., Moral P., Calo C.M., Autori L., Mameli G.E., Succa V., Varesi L., and Vona G. (1998) Genetic structure of southwestern Corsica (France). American Journal of Human Biology, 10: 567–577. Moreno P., and Moral P. (1983) Distribucion de grupos sanguineos y enzimas eritrocitarios en una poblacion de Gerona (España). Sep Garcia de Orta, Ser, Antropobiol., Lisboa, 2: 275–282. Mourant A.E., Kopec A., and Sobczak K. (1976) The distribution of the human blood groups and other polymorphisms. Oxford Monographs on Medical Genetics, Oxford University Press, Oxford, pp. 84–88. Nan Juan M.O., and Gart J. (1976) Bernstein’s and gene counting methods in generalized ABO like systems. Annals of Human Genetics, 64: 361. Ouhmani K., Canossi A., Piancatelli D., Di Rocco M., Del Beato T., Liberatore G., Aureli A., Ben Jouad A.E., El Aouad R., Adorno D., and Casciani C.U. (2002) Sequence-based analysis of the HLA-DRB1 polymorphism in Metalsa Berber and Chaouya Arabic speaking groups from Morocco. Human Immunology, 63: 129–138. Piazza A., Olivetti E., Barbanti M., Reali G., Domenici R., Berciolini P., Caenazzo L., Corvito P., Bestitti A., Bonavita V., Crino C., Pascali V., Fiori A., and Bargagna M. (1989) The distrrbution of some polymorphisms in Italy. Gene Geography, 3: 69–139. Poumpouridou A., and Scheil H.G. (1995) the distribution of the ABO and Rhesus blood groups (phenotype and allele frequencies) in the population of Cyprus. Gene Geography, 9: 197–205. Reynolds J., Weir B.S., and Cockerham C.C. (1983) Estimation of coancestry coefficient: basis for a short-term genetic distance. Genetics, 105: 767–779. Roychoudhury A.K., and Nei M. (1988) Human polymorphic genes world distribution. New York, Oxford University Press. Ruffle J, and Lefevre-Witier P. (1972) Ergebnisse serologischer Foungen in der Sahara. In: Die Sahara und ilrre Ralldgebiete, Band II. Human Geographie. Weltforum Verlag, Munich, pp. 255–263. Saitou N., and Nei M. (1987) The neighbor-joinning method: a new method for reconstructing phylogenetic trees. Molecular Biology and Evolution, 4: 406–425. Sanchez-Mazas A. (2000) The Berbers of North Africa: genetic relationships according to HLA and other polymorphisms. In: Arnaiz-Villena A. (ed. ), Prehistoric Iberia, Genetics, Anthropology and Linguistics. Kluwer Academic/Plenum Publishers, New York, pp. 65–77. Simoni L., Gueresi P., Pettener D., and Barbujani G. (1999) Patterns of gene flow inferred from genetic distances in the Mediterranean region. Human Biology, 71: 399–415. Straus L.G. (1989) Age of the modern Europeans. Nature, 342: 476–477. Stringer C. (2000) Coasting out of Africa. Nature, 405: 24–27. Tsiakalos G., Walter H., Hilling M., and Windhof O. (1980) Investigations on the distribution of genetic polymorphisms in Greece. 1. Blood group polymorphisms. Anthropologischer Anzeiger, 38: 237–250. Walter H., Arndt-Hanser A., Raffa M.A., and Gumbel B. (1975) On the distribution of some genetic markers in Libya. Human genetic, 27(2): 129–136.